Raleigh, NC, 8/9/2013 – Recently young minds in grades K-5 made a connection between their robotic creations and NASA’s Curiosity mission to Mars. Thanks to an exciting presentation by NASA Solar System Ambassador, Marc Fusco, in a STEM For Kids’ summer / track-out camp, curious campers had a feast getting information on space technologies. Next week, Cary campers will get a dose of industry knowledge by getting down to the bare chips inside their robots. Brian Hammill, senior field applications engineer with Atmel Corporation, will speak with campers about the brain of their robotic creations on Wednesday, Aug. 14. Atmel Corporation is headquartered in San Jose California with manufacturing and design locations worldwide. Atmel is the leader in microcontrollers, small computers on a chip. Atmel’s microcontrollers are seated inside camper’s Lego robots, as well as other everyday technologies. On a mission to make STEM fun and real for kids, STEM for Kids, a Raleigh-based organization, is providing their innovative Complete STEM[TM] programs through year-round camps, in-school workshops and school teacher trainings. Hammill holds a bachelor of science in electrical engineering from N.C. State University and has nearly 22 years of experience in electrical and electronic engineering. 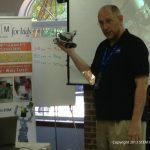 Hammill will discuss the relevance of electronics and robotics in campers’ lives to inspire them to maintain their interest in engineering and encourage them to be innovative in their own robotic designs in the camp. Hammill will be speaking at 9:30 a.m. on Aug. 14 at the camp’s Cary location at 2965 Kildaire Farm Road. For media enquiries contact fun@stemforkids.net or at (919) 297-8366.